One of the great pleasures of skiing so much vertical in the "Polar Vortex" was retu rning to a room with a fire­place. Our group dinner Monday at "21Steps" was enjoyed by all. Since we had full kitchens, delicious lefto­vers did not go to waste. We heard the restaurants were great, but having a wonderful chef as a roommate proved to be an added bonus: fresh sockeye salmon, wine and no reservations required. On Wednesday, Patti (intrepid trip leader), Viktoria and Kathy took the Showcase T-bar and then hiked the hill to the Blackcomb Glacier . The sky was bombastically blue knockout white deep powder contrasted with in­timidating dark blue shadows from Blackcomb Peak that reached far across the vast snovvfield It was an ex­traordinary sight, a perfect time to jump into the ungroomed and the unknown. Viktoria schussed ahead of us in very good form with all of us tryin g to maintain enough speed to coast along the long flat at the bottom. We heard two of our expert skiers didn't make it out of one of the areas by lift closing time and had to hike. They missed our group Happy Hour (noisy but fun) but had an adventure to share. Feeding the Whiskeyjack birds out of our hands was a unique nature experience. We met a nice local who became our "mountain host." He tried to convince us to stay in Canada, but alas, difficult to explain at work. During the week Kathy would awake and pass time at the window observing the groomers on Blackcomb. Several would suddenly converge on a slope at once with their headlights flaring and then disappear like fire flies. Watching the distant twinkle of lights all over the mountain at night was a beautiful spectacle . On Saturday, some groomers didn't leave the slopes until after dawn. Kathy met a couple of the groomers heading to work on the Gondola, both women had more than 25 years of service on the mountain. They were both quite impressive and will always have our appreciation for their excellent work. We want to add riding with groomers to our bucket list! Thanks Professional Photographer, Viktoria...we look good and Kathy Tannert, Biographer...until we ski again. 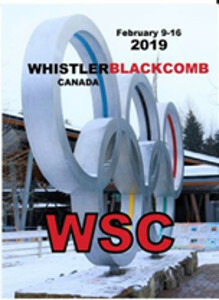 See all the flickr pictures from Whistler Blackcomb. Coming soon.